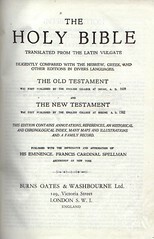 Contents The Bible in the Douay Version as revised by Challoner. Images Title page from 1911? edition, Title page from a 1916? edition. 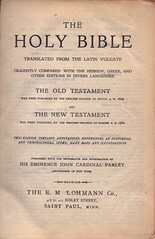 Title The / Holy Bible / Translated from the Latin Vulgate / Diligently Compared with the Hebrew, Greek, and / Other Editions in Divers Languages. 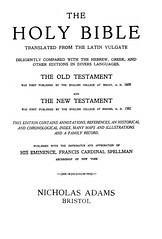 / The Old Testament / Was First Published by the English Dollege at Douay, A.D. 1609 / and / The New Testament / Was First Published by the English College at Rheims, A.D. 1582 / This Edition Contains Annotations, References, an Historical / and Chronological Index Many Maps and Illustrations / Published with the Imprimatur and Approbation of / His Eminence John Cardinal Farley / Archbishop of New York / B. Herder / 68, Great Russell Street / London, W. C.
Title The / Holy Bible / Translated from the Latin Vulgate / Diligently Compared with the Hebrew, Greek, and / Other Editions in Divers Languages. 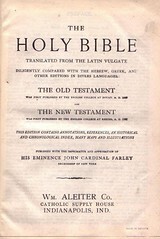 / The Old Testament / Was First Published by the English Dollege at Douay, A.D. 1609 / and / The New Testament / Was First Published by the English College at Rheims, A.D. 1582 / This Edition Contains Annotations, References, an Historical / and Chronological Index Many Maps and Illustrations / Published with the Imprimatur and Approbation of / His Eminence John Cardinal Farley / Archbishop of New York / B. Herder / Wm. Aleiter Co. / Catholic Supply House / Indianapolis, Ind. 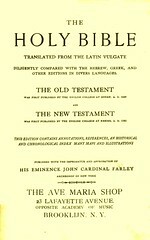 Title The / Holy Bible / Translated from the Latin Vulgate / Diligently Compared with the Hebrew, Greek, and / Other Editions in Divers Languages. 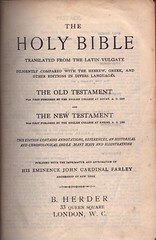 / The Old Testament / Was First Published by the English Dollege at Douay, A.D. 1609 / and / The New Testament / Was First Published by the English College at Rheims, A.D. 1582 / This Edition Contains Annotations, References, an Historical / and Chronological Index Many Maps and Illustrations / Published with the Imprimatur and Approbation of / His Eminence John Cardinal Farley / Archbishop of New York / M.F. Sheehan Co. / 17-19 Beach Street / Boston, Mass. 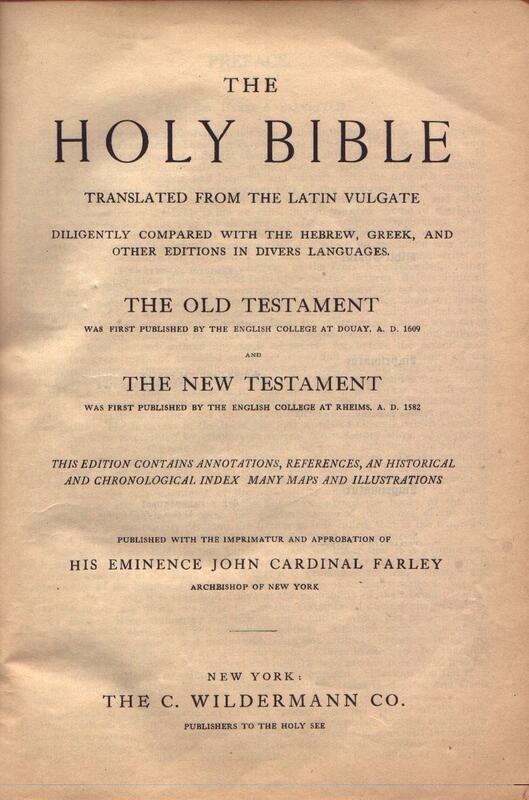 Title The / Holy Bible / Translated from the Latin Vulgate / Diligently Compared with the Hebrew, Greek, and / Other Editions in Divers Languages. 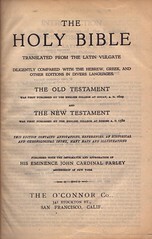 / The Old Testament / Was First Published by the English Dollege at Douay, A.D. 1609 / and / The New Testament / Was First Published by the English College at Rheims, A.D. 1582 / This Edition Contains Annotations, References, an Historical / and Chronological Index Many Maps and Illustrations / Published with the Imprimatur and Approbation of / His Eminence John Cardinal Farley / Archbishop of New York / B. Herder / 33 Queen Square / London, W. C.
Title The / Holy Bible / Translated from the Latin Vulgate / Diligently Compared with the Hebrew, Greek, and / Other Editions in Divers Languages. / The Old Testament / Was First Published by the English College at Douay, A.D. 1609 / and / The New Testament / Was First Published by the English College at Rheims, A.D. 1582 / This Edition Contains Annotations, References, an Historical / and Chronological Index Many Maps and Illustrations / Published with the Imprimatur and Approbation of / His Eminence John Cardinal Farley / Archbishop of New York / The Ave Maria Shop / 23 Lafayette Avenue / Opposite Academy of Music / Brookl[y]n, N. Y. 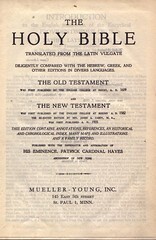 Title The / Holy Bible / Translated from the Latin Vulgate / Diligently Compared with the Hebrew, Greek, and / Other Editions in Divers Languages. / The Old Testament / Was First Published by the English College at Douay, A.D. 1609 / and / The New Testament / Was First Published by the English College at Rheims, A.D. 1582 / This Edition Contains Annotations, References, an Historical / and Chronological Index Many Maps and Illustrations / Published with the Imprimatur and Approbation of / His Eminence John Cardinal Farley / Archbishop of New York / Rogers Church Goods Co., / 129 S. 4th. St., / Louisville, Ky. 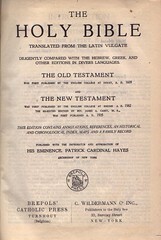 Title The / Holy Bible / Translated from the Latin Vulgate / Diligently Compared with the Hebrew, Greek, and / Other Editions in Divers Languages. 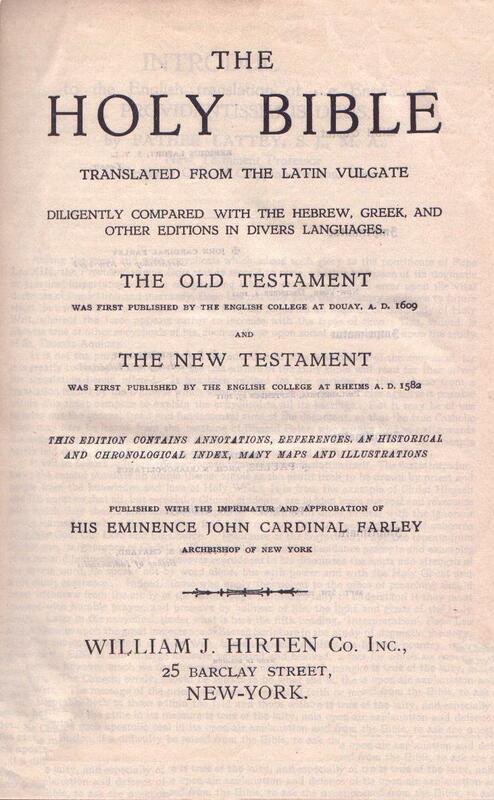 / The Old Testament / Was First Published by the English Dollege at Douay, A.D. 1609 / and / The New Testament / Was First Published by the English College at Rheims, A.D. 1582 / This Edition Contains Annotations, References, an Historical / and Chronological Index Many Maps and Illustrations / Published with the Imprimatur and Approbation of / His Eminence John Cardinal Farley / Archbishop of New York / Matthew F. Sheehan Co., / 22 Chauncey St., / Boston, Mass. 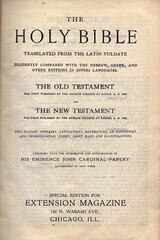 Title The / Holy Bible / Translated from the Latin Vulgate / Diligently Compared with the Hebrew, Greek, and / Other Editions in Divers Languages. 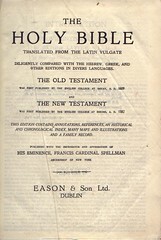 / The Old Testament / Was First Published by the English Dollege at Douay, A.D. 1609 / and / The New Testament / Was First Published by the English College at Rheims, A.D. 1582 / This Edition Contains Annotations, References, an Historical / and Chronological Index Many Maps and Illustrations / Published with the Imprimatur and Approbation of / His Eminence John Cardinal Farley / Archbishop of New York / The E. M. Lohmann Co., / 413 to 417 Sibley Street, / Saint Paul, Minn. 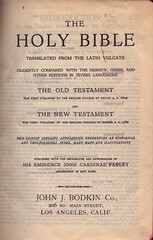 Title The / Holy Bible / Translated from the Latin Vulgate / Diligently Compared with the Hebrew, Greek, and / Other Editions in Divers Languages. 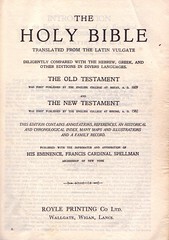 / The Old Testament / Was First Published by the English Dollege at Douay, A.D. 1609 / and / The New Testament / Was First Published by the English College at Rheims, A.D. 1582 / This Edition Contains Annotations, References, an Historical / and Chronological Index Many Maps and Illustrations / Published with the Imprimatur and Approbation of / His Eminence John Cardinal Farley / Archbishop of New York / John J. Bodkin Co., / 206 So. Main Street, / Los Angeles, Calif. 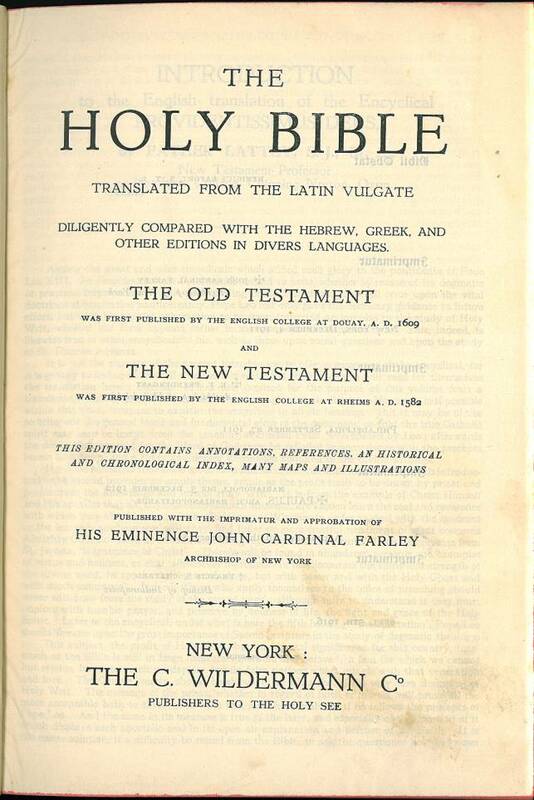 Title The / Holy Bible / Translated from the Latin Vulgate / Diligently Compared with the Hebrew, Greek, and / Other Editions in Divers Languages. 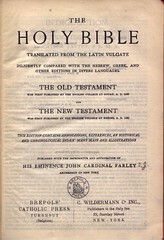 / The Old Testament / Was First Published by the English Dollege at Douay, A.D. 1609 / and / The New Testament / Was First Published by the English College at Rheims, A.D. 1582 / This Edition Contains Annotations, References, an Historical / and Chronological Index Many Maps and Illustrations / Published with the Imprimatur and Approbation of / His Eminence John Cardinal Farley / Archbishop of New York / Special Edition for / Extension Magazine / 180 N. Wabash Ave. / Chicago, Ill. Comments The Belgian Co. Etbl. Brepols of Belgium, which actually printed all the editions in this series, usually does not show its name on the title page. Recent Sales A copy of this edition sold for $50 on July 10, 2014 on Ebay (Ebay No. 360976072529). 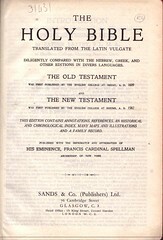 Title The / Holy Bible / Translated from the Latin Vulgate / Diligently Compared with the Hebrew, Greek, and / Other Editions in Divers Languages. / The Old Testament / Was First Published by the English Dollege at Douay, A.D. 1609 / and / The New Testament / Was First Published by the English College at Rheims, A.D. 1582 / This Edition Contains Annotations, References, an Historical / and Chronological Index Many Maps and Illustrations / Published with the Imprimatur and Approbation of / His Eminence John Cardinal Farley / Archbishop of New York / The O'Connor Co. / 341 Stockton St. / San Francisco, Calif. 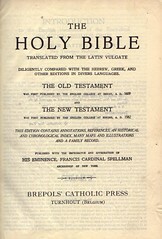 Title The / Holy Bible / Translated from the Latin Vulgate / Diligently Compared with the Hebrew, Greek, and / Other Editions in Divers Languages. / The Old Testament / Was First Published by the English College at Douay, A.D. 1609 / and / The New Testament / Was First Published by the English College at Rheims, A.D. 1582 / This Edition Contains Annotations, References, an Historical / and Chronological Index Many Maps and Illustrations / Published with the Imprimatur and Approbation of / His Eminence John Cardinal Farley / Archbishop of New York / William Hirten Co. Inc., / 25 Barclay Street, / New York. Comments Unusual edition with a dated title page. 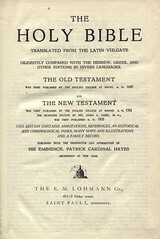 Comments This and most subsequent editions contain the New Testament as revised by Father Carey. 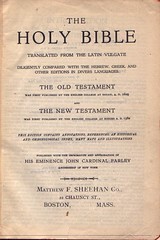 Title The / Holy Bible / Translated from the Latin Vulgate / Diligently Compared with the Hebrew, Greek, and / Other Editions in Divers Languages. 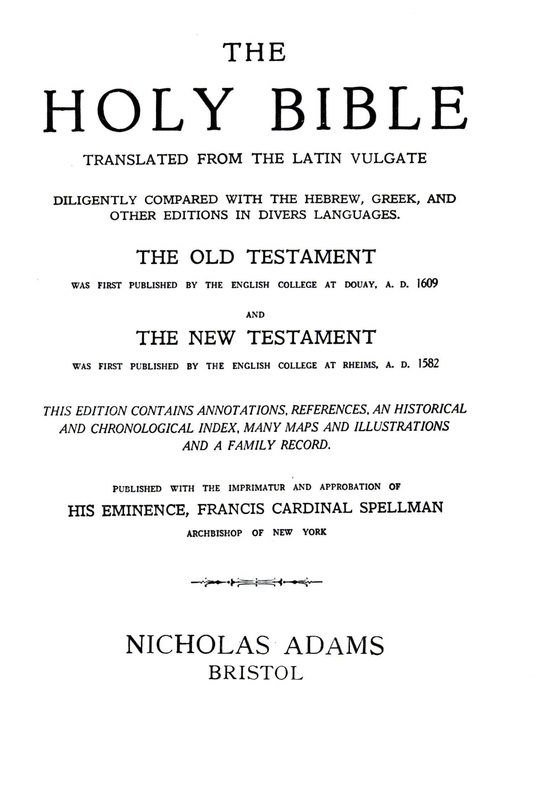 / The Old Testament / Was First Published by the English Dollege at Douay, A.D. 1609 / and / The New Testament / Was First Published by the English College at Rheims, A.D. 1582 / The Re-Edited Edition by Rev. 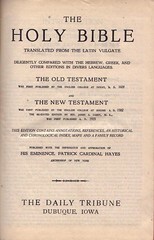 James A. Carey, M.A., / Was First Published A.D. 1935 / This Edition Contains Annotations, References, an Historical / and Chronological Index, Maps and Illustrations, / and a Family Record / Published with the Imprimatur and Approbation of / His Eminence, Patrick Cardinal Hayes / Archbishop of New York / The Douay Bible House / New York 8, N. Y. 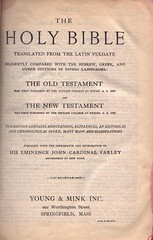 Publisher The Douay Bible House, N.Y. 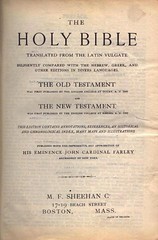 Title The / Holy Bible / Translated from the Latin Vulgate / Diligently Compared with the Hebrew, Greek, and / Other Editions in Divers Languages. 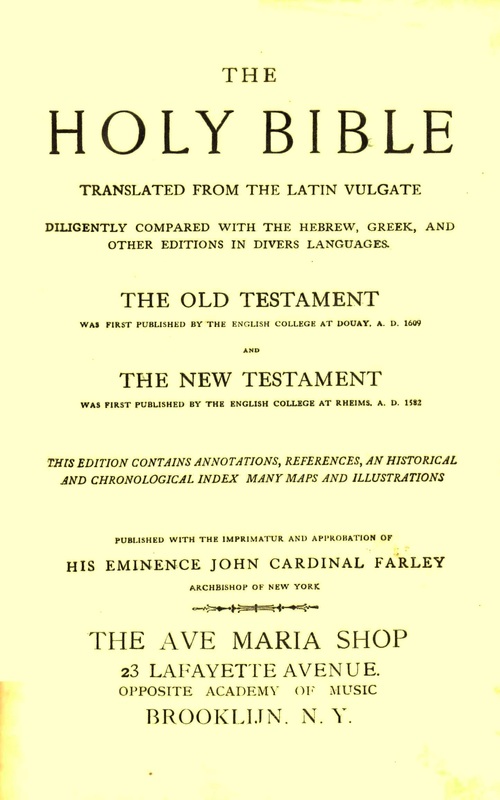 / The Old Testament / Was First Published by the English Dollege at Douay, A.D. 1609 / and / The New Testament / Was First Published by the English College at Rheims, A.D. 1582 / The Re-Edited Edition by Rev. 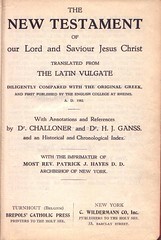 James A. Carey, M.A., / Was First Published A.D. 1935 / This Edition Contains Annotations, References, an Historical / and Chronological Index, Maps and Illustrations / and a Family Record / Published with the Imprimatur and Approbation of / His Eminence, Patrick Cardinal Hayes / Archbishop of New York / Mueller - Young, Inc. / 145 East 5th Street / St. Paul 1, Minn. 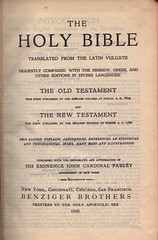 Title The / Holy Bible / Translated from the Latin Vulgate / Diligently Compared with the Hebrew, Greek, and / Other Editions in Divers Languages. 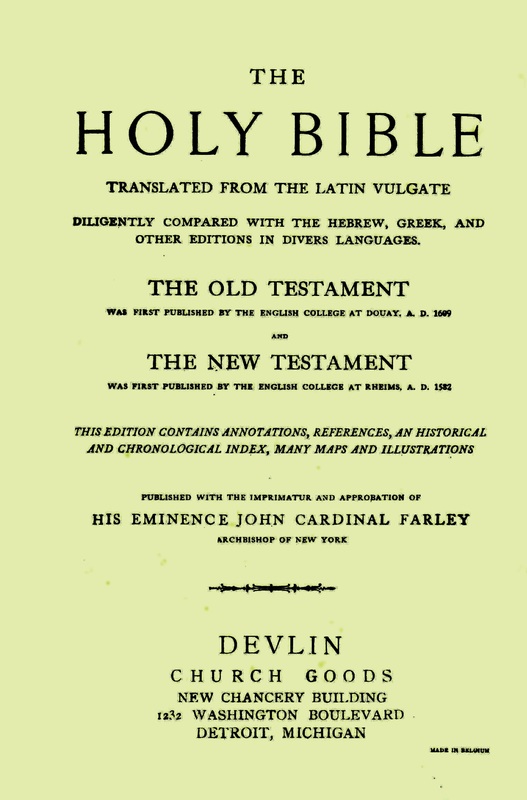 / The Old Testament / Was First Published by the English Dollege at Douay, A.D. 1609 / and / The New Testament / Was First Published by the English College at Rheims, A.D. 1582 / This Edition Contains Annotations, References, an Historical / and Chronological Index, Maps and Illustrations / and a Family Record. 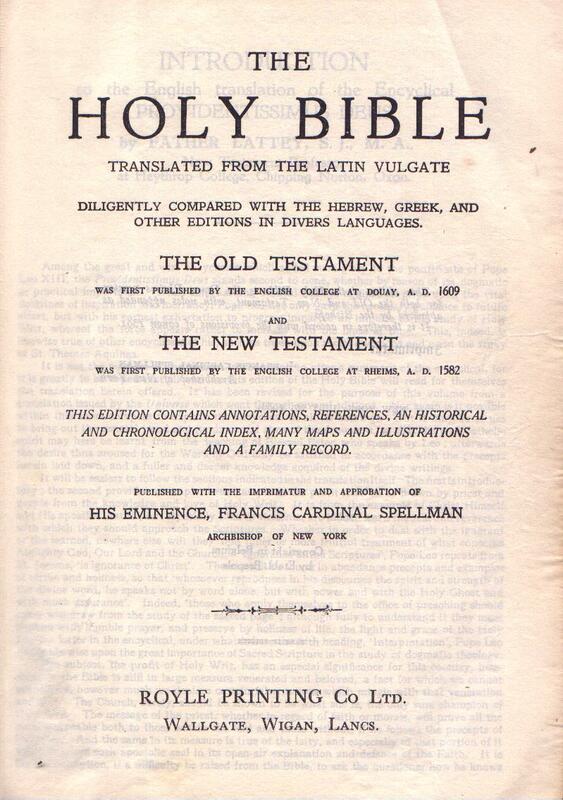 / Published with the Imprimatur and Approbation of / His Eminence, Francis Cardinal Spellman / Archbishop of New York / Sands & Co. (Publishers) Ltd. / 76 Cambridge Street / Glasgow, C. 3 / Head Office: 15 King Street, Covent Garden / London W.C.2. 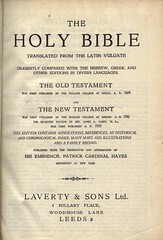 Title The / Holy Bible / Translated from the Latin Vulgate / Diligently Compared with the Hebrew, Greek, and / Other Editions in Divers Languages. / The Old Testament / Was First Published by the English College at Douay, A.D. 1609 / and / The New Testament / Was First Published by the English College at Rheims, A.D. 1582 / This Edition Contains Annotations, References, an Historical / and Chronological Index, Maps and Illustrations / and a Family Record. / Published with the Imprimatur and Approbation of / His Eminence, Francis Cardinal Spellman / Archbishop of New York / Royle Printing Co Ltd. / Wallgate, Wigan, Lancs. 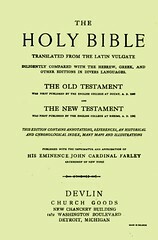 Contents The Bible in the Douay Version as revised by Challoner; the New Testament in this edition does not contain the Carey revisions. 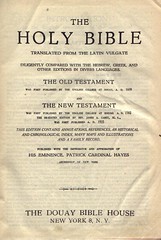 Title The / Holy Bible / Translated from the Latin Vulgate / Diligently Compared with the Hebrew, Greek, and / Other Editions in Divers Languages. / The Old Testament / Was First Published by the English College at Douay, A.D. 1609 / and / The New Testament / Was First Published by the English College at Rheims, A.D. 1582 / This Edition Contains Annotations, References, an Historical / and Chronological Index, Maps and Illustrations / and a Family Record. / Published with the Imprimatur and Approbation of / His Eminence, Francis Cardinal Spellman / Archbishop of New York / Nicholas Adams, Bristol. 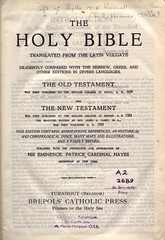 Comments One copy by this publisher has a frontispiece with a portrait of Pope John XXIII, whose papacy began in 1958. 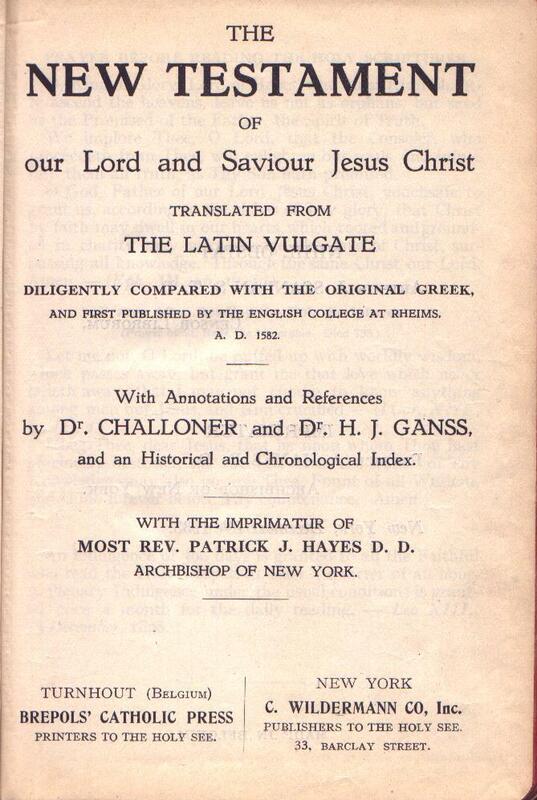 Title The / New Testament / of / our Lord and Saviour Jesus Christ / Translated from / the Latin Vulgate / Diligently Compared with the Original Greek, / and First Published by the English College at Rheims, / A.D. 1582./ with Annotations and References / by Dr. Challoner and Dr. H. J. Ganss, / and an Historical and Chronological Index. / with the Imrpimatur of / Most Rev. Patrick J. Hayes D.D. / Archbishop of New York. / Turnhout (Belgium) / Brepols' Catholic Press / Printers to the Holy See / New York / C. Wildermann Co, Inc. / Publishers to the Holy See / 33, Barclay Street.